That’s right, no baby food, no purees, no mush. The argument is that babies who eat purees from a spoon fed by the parents learn how to swallow before they learn how to chew. They don’t get used to the texture of food and as a result can become picky eaters later in life. Babies between the ages of 6 months and 1 year get all the nutrition they need from breast milk or formula, so the food they eat is just for learning and exploring. No need to force them to eat, just give them a tray full of a variety of soft foods (cooked carrots, beans, fruit, etc) and let them go at it. The downside? First of all, it’s really messy. You can’t give a baby a bath every single time they finish a meal, but that’s what wipes are for, right? Feed them in nothing but a diaper and wipe them down after. Secondly, they might choke. The website says it’s better to learn what to do when a child is choking than to constantly worry about it happening. They say to make sure that risky foods are cut up properly (grapes cut in half), but really since they’re learning how to chew/gnaw before they learn how to swallow, they won’t choke as much as a baby food fed baby might. I plan on trying out this new method of food introduction. I’m not saying it’s the best way or the only way to do things. I do think it seems a whole lot easier than buying or making baby food and spoon feeding it to a squirmy baby. What do you think? Have you tried BLW? Would you? My mom did this with us, she never gave us baby food. She would just cut up whatever she was eating and let us use our fingers and eat ourselves. She said she got lots of funny looks, but we became independent eaters much sooner than baby food babies. While I didn't realize it was called something official, my sister-in-law has been doing this. 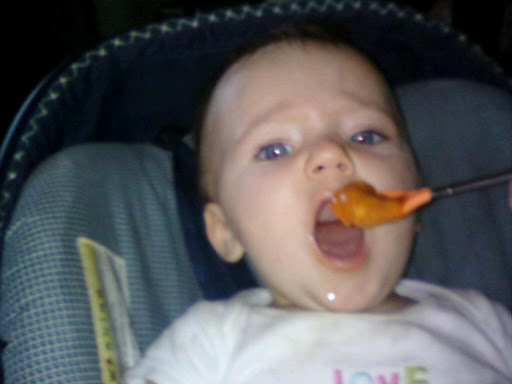 She sends pictures of me constantly of my nephew chewing on bananas, carrots, etc. More than half the Mums in my Mothers group do BLW! The health care nurses over here promote it. Its fantastic – and Ikea has some great bibs that cover body and arms and velcro at the back – great for those messy dishes in winter!